Don’t Travel to St. Thomas Before Reading This! St. Thomas in the U.S. Virgin Islands has been revitalized in recent years. It is not only the ultimate tropical vacation location; it can be as affordable as a similar vacation to Florida. The warm water is a brilliant turquoise hue, ideal for snorkeling and viewing an abundance of marine life. Although the island is just 31 square miles, you’ll find a variety of attractions and even two cities with hot spots for exciting nightlife options as well. And, unlike Florida, temperatures here are typically in the 80s during the day and the 70s at night all year round. If you’re planning a getaway to St. Thomas, consider these important things to “know before you go” to ensure the best possible experience on the island. St. Thomas is part of the U.S. Virgin Islands, an unincorporated territory of the United States, which means that US citizens can travel there without a passport just as they would when traveling between states in the mainland. Carrying a passport can still be a good idea as hopping between islands from St. Thomas is fairly easy, and a passport is required for travel to the British Virgin Islands such as Tortola or Virgin Gorda. You’ll find everyone dressed fairly casually in the Virgin Islands. This is a destination meant for relaxation – there is no need for a tie or a fancy dress. Men should pack several pairs of shorts, t-shirts and perhaps a polo shirt or two as well as one pair of slacks for going out at night, while women might bring a few cute sundresses, a wrap skirt, shorts, tank tops and other casual attire. Beach shoes or sandals as well as a pair of comfortable walking shoes for exploring inland are a must, and you’ll want to bring two bathing suits so that you have a dry one available when the other is wet. If you have any prescription medications, be sure to bring enough for the duration of your trip and carry a note from your physician, especially for any prescribed narcotics. All personal care items can be purchased on St. Thomas (although they can be a little pricey) so try to bring your own in travel-sized containers. Plenty of sunscreen and insect repellant are also musts. On St. Thomas, life tends to move at a slower pace than on the mainland. Don’t rush things – have patience and consider your time here as a chance to relax and enjoy a nice breather. Allow things to be accomplished at their own pace. Never treat Islanders as servants, or tourist attractions. Provide locals with respect and try not to be patronizing or condescending. Skimpy dress such as super short shorts or any very revealing clothing should not be worn while shopping or dining in town; only wear bathing suits at the swimming pool or the beach. When speaking with locals the conversation should always begin with a greeting such as “Good morning,” “Good afternoon,” or “Good night”. Virgin Islanders are generally a conservative and quiet people. Good manners and formality are highly esteemed. Ease into a conversation instead of jumping right in with a request by asking how the person’s day is going, but avoid getting too personal too quickly. One word to the wise…the taxi drivers and store barkers downtown are the only exception. You will be solicited at least 50 times for a taxi or some jewelry sale. So it is ok to ignore them!!! Exploring the island requires some form of motorized transportation, for maximum freedom renting a car can be the best option and will allow you to see everything St. Thomas has to offer at your own pace. Car rental agencies are located at the airport as well as near the main cruise ship dock and large resorts. Scooters are also an excellent way to get around the island. Taxis are readily available and there are also drivers that run dollar rides via “safaris.” A safari is a truck that’s been outfitted with bench seating in the back. They run during the day and are not on a set schedule. You can hop a ride on a safari by sticking out your arm when you see it approaching. Most trips are just $1 or $2 per person. Like all resort and vacation destinations, it pays to shop for the best deals. Small boutique hotels, resorts and private villas abound on the island. If you stay in a villa you will most likely need to rent a car or scooter to get around. There are activities for all ages and interests. Whether taking a boat trip, scuba diving, parasailing or snorkeling, call the outfit before you arrive on island to make reservations. Check out 74 Things to Do on St. Thomas and St. John at: http://bit.ly/YRlwnH. Locals throughout the USVI speak English and the currency used is the U.S. dollar. You’ll even find American TV stations in your hotel and many similar chain stores that are found on the mainland. While this is an exotic island, it also has the familiar atmosphere of home. The biggest difference may be the lack speed and efficiency. If you insist on everything being done at a fast pace, you may want to stick with a Florida vacation instead. Those who appreciate fine art and a good shopping experience will be happy to know that visitors can exit St. Thomas with $1,600 in duty-free goods which is double that of most destinations. The island is renowned as the biggest tax-free, duty-free shopping hub of the Caribbean and is home to many artists. 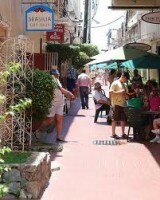 The main shopping areas include downtown Charlotte Amalie and around the Havensight dock. And don’t forget to brake for iguanas! If you have any questions about events, activities and goings on while you are visiting, enter your email on the home page of www.virginislandsaver.com.